Although there are only 175 employers in Idaho’s mining industry, their impact on the state’s economy is much greater. Mining employs 2,600 people directly, but because of the higher-than-average wages the industry pays, another 6,300 workers owe their jobs indirectly to mining because of the economic activity those high wages generate in what is called the multiplier effect. Mining also has the potential to pay, on average, higher wages than any other sector. In 2011, the average wage of a mining industry worker was $68,000 compared to $35,500 for all other industries. A shortage of skilled miners, and the higher risks they face on the job, factor into the high paychecks, stock investments and bonuses. The average wage in the mining industry jumped 12.6 percent from $60,412 adjusted for inflation to $68,021 by 2011 while the average wage in all other sectors declined 2.4 percent in the continuing fallout from the recession. Half of the total wages in 2011 in mining was paid in northern Idaho, where several larger mining headquarters are located and bonuses are common. Mining experienced a net loss of jobs from 2011 to 2012, but it was just 78 jobs, a far cry from the contraction in other sectors. Mining depends significantly on the world market prices for silver and gold as well as the supply and demand for other minerals such as silver, iron ore, molybdenum, cobalt and garnet for industrial uses – making it one of the most volatile industries. 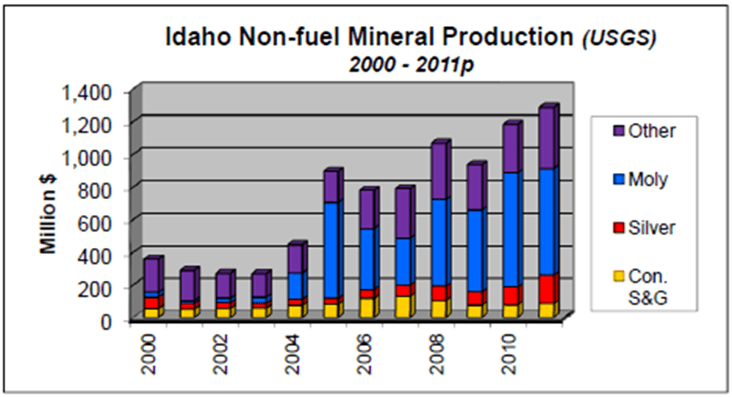 According to the U.S. Geological Survey’s 2012 Mineral Commodity Summaries, Idaho produced a record $1.29 billion in nonfuel minerals in 2011, up from 1.2 billion in 2010. That ranked Idaho 17th among the 50 states. The leading commodities in order of value were molybdenum, phosphate rock, silver, sand and gravel for construction and lead. Molybdenum is used to make automotive parts, gas pipes, stainless steel and, as a pure metal, filament supports in light bulbs, metalworking dies and furnace parts. Phosphate rock is used to produce phosphate fertilizers – one of Idaho’s top exports – and feed additives for livestock. Phosphate rock is only mined in four states. The others are Florida, North Carolina and Utah. Mining will continue to prosper throughout Idaho in the coming years. The Idaho Division of Financial Management projects that the industry’s employment should grow at an annual average rate of 3.9 percent from 2012 through 2016. This entry was posted in Employers, Uncategorized and tagged idaho employment, idaho mining, mining on January 22, 2013 by Idaho Department of Labor.